It distributes the fiery energy of digestion, aids circulation and current flow. The umbilical contact releases the fire of oxidation and circulation from the center to the circumference. This is a very effective treatment for sciatica. 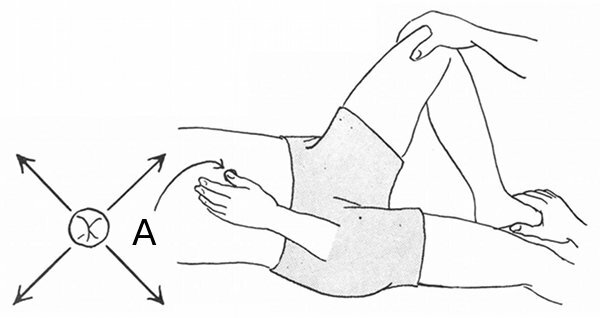 The relaxation in the groins relieves the anterior muscle tenslon and paIn. Thumb is sunk well down without force into umbilicus and directional pressure given. Avoid pressure on the abdominal aorta on left side of umbilicus. Single contacts for each side - knee and umbilicus or foot and umbiucus. Use a firm contact on knee or foot, with or without motion.